Anyone who’s spent time clicking around the website Engrish.com will be well-prepared to enjoy David Henry Hwang’s new play “Chinglish.” The central character is an American entrepreneur from Cleveland, Daniel Cavanaugh (Gary Wilmes), whose family business – Ohio Signage – is suffering during the economic downturn, so he’s decided to scout out new customers in China, where the English translations on bilingual signs leaves a lot to be desired. (One handicapped restroom is labeled “Deformed Man’s Toilet.”) He arrives thinking there’s a fortune or at least a living to be made correcting the ignorant foreigners and then getting the hell out. As you might imagine with any culture-clash comedy, he ends up learning plenty of lessons himself about language, manners, business, politics, reputations, time, and romance. Some of it is predictable, but much of it is not. I left the theater entertained, thoughtful, and wondering “What kind of crazy play was that?” which is a combo I like. In the thirty years since he made his New York debut at the Public Theater with “FOB” (in which a couple of American-born Chinese – ABCs – kids encounter one who’s “fresh off the boat”), Hwang has never confined himself to one genre as a playwright. He’s best-known for his Tony Award-winning drama “M. Butterfly,” the true story of a love affair between a French diplomat and a cross-dressing Chinese opera performer, which was also made into a film. And almost all his work deals in some way with Chinese-American experiences. But he’s also written romantic comedies, family plays, folk tales, political satires, books for Broadway musicals (Elton John’s “Aida,” Phil Collins’s “Tarzan”), and opera libretti (Howard Shore’s “The Fly”). He even wrote a song with Prince! There are no real musical numbers in “Chinglish,” but otherwise the play mashes up almost all the various genres at Hwang’s disposal, morphing from scene to scene in a way that mimics the experience of entering a new culture and trying to get your bearings. Landing in the mid-sized city of Guiyang, Cavanaugh almost immediately acquires a Mandarin-speaking British consultant, Peter Timms (Stephen Pucci), who promises to coach him through the minefields of doing business in China. After his first pitch to the Minister of Culture (Larry Lei Zhang), who’s just about to open an expensive new arts center, Cavanaugh acquires another willing partner in the person of Vice-Minister Xi Tan (Jennifer Lim). These two turn out not quite to be who they claim to be, and they have their own agendas. Can you guess which one betrays Cavanaugh and which one has a love affair with him? 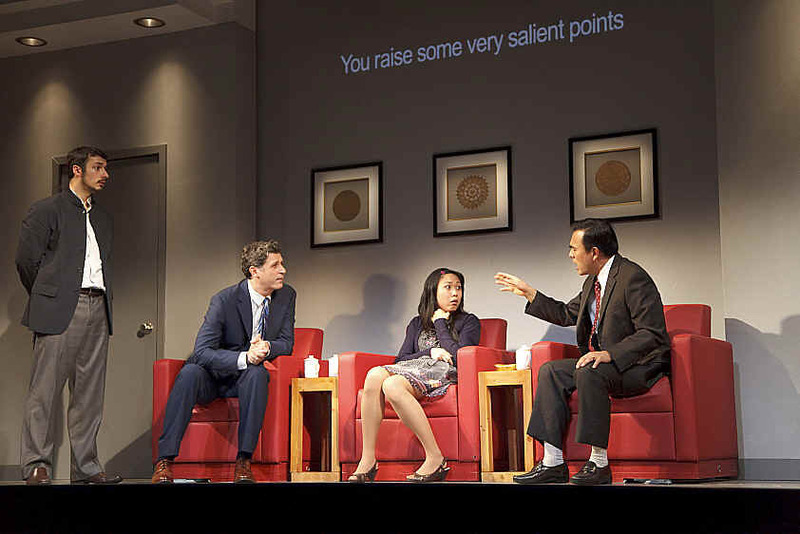 “Chinglish” is an unusual play to find on Broadway – a new contemporary American play with no stars in it – and I can’t imagine that it will play terribly long. But it’s beautifully produced, staged by Leigh Silverman with the precision and energy that have become her trademarks, and impeccably designed. David Korins’ ingenious interlocking turntables do their thing seamlessly, Brian MacDevitt’s lighting is outstanding, and sound designer Darron L. West stitches scenes together with a soundtrack that translates the story into yet another dimension. Among the performances, I found Pucci’s the weakest; the moments where he loses his cool are unconvincing, but then again his character is the most schematic and least satisfying as written. The Chinese- American actors, all new to me, are superb, especially Johnny Wu and Angela Lin, who have fun playing contrasting parts. Lim triumphs in the play’s trickiest role. I guess I haven’t even mentioned that a good third of the play is in Mandarin Chinese, with English surtitles cleverly projected onto the set. All the characters have to seamlessly dance among English, Chinese, and the projected translations, which frequently produce the play’s biggest laughs. Lim’s Xi Yiu relies heavily on surfing among these various language barriers, and she manages it beautifully. Wilmes matches her – and mismatches her – note-for- note. He’s a super-talented performer previously known for working with cutting-edge downtown directors like Richard Maxwell and Richard Foreman. Here he’s a revelation in a mainstream romantic comedy, inhabiting a big lunky Middle American businessman with equal parts savvy, humor, vulnerability, and cluelessness. Oh, and by the way, his character takes his share of abuse for his language shortcomings, just as any of us would. I can make fun of giggle-worthy signs on Engrish.com all I want, but just try asking me to speak Chinese.